The Guinness’s 250th Anniversary Stout was released in the US, Australia and Singapore on 24 April 2009. I got my first good bit of information on Guinness 250th Anniversary Stout from the NPR show All Things Considered, April 25, 2009 (Listen Now) Therein, Jacki Lyden discussed the New Recipe, while it was also mentioned that this beer was not available in Ireland. It is postulated that you don’t F’ with Guinness in Ireland. After hearing all the fascinating things about the stout and reading the articles that popped up on various web sites like DraftMag I knew I had to give it a try. It took me a while to actually find it, but I finally found it at the CloverLeaf Tavern in Caldwell on their Guinness night. What did I think of the Guinness 250? Well to me it was in the vein of they came to the US and tried a Craft Brewery stout, studied a little about American Craft beer and tried to make a Guinness Version. The 250 is definitely a little maltier, a little smoother , but the mouth feel was lacking. Served too cold this beer was crisp and actually a little refreshing but lacked flavor. More of the its classic Guinness flavor came as its temperature increased. The aftertaste was smooth, though, and had a decent drinkability. I am glad to say I finally had the 250. It’s the not the most epic beer in the world but it’s respectable. 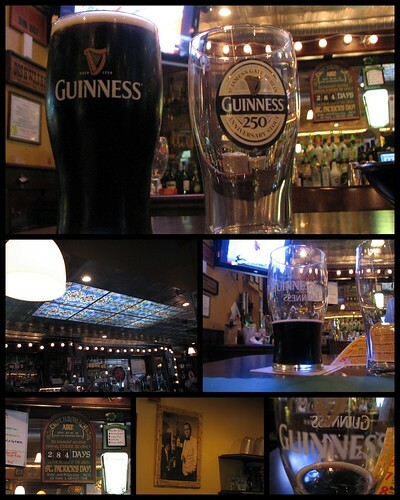 A good try on Guinness’s part. As for the Cloverleaf, that was a nice place to have a drink. Very old school in ways, but it had a nice layout. The staff was kind and friendly. Like a poozer. I went there alone, but was treated kindly. They have 25 BEERS ON DRAFT with a large list of various other bottled beers. Check them out here http://cloverleaftavern.com/beer.shtml . It’s a little too far for me to frequent, but it’s a place I’ll definitely go back to, and by the way, they have REALLY good steak fries. Country Boy Heads to the Big Apple!